The hits just keep coming from the “silky Swede”, or in the case of Nicklas Backstrom, the mind-boggling, acrobatic, tape-to-tape passes. Backstrom turned in another gem of a dish Monday night in the Capitals 4-2 win over the red-hot Oilers at Capital One Arena. The pass even drew praise from the Oilers’ goaltender, Cam Talbot. Backstrom’s stellar, tape-to-tape “spin-o-rama” pass came with 11:50 remaining in the second period of Monday night’s tilt with the Oilers, with the Capitals leading 2-1. Moving along the right wing boards, away from the goal, Backstrom would abruptly spin and deliver a backhanded, tape-to-tape pass to T.J. Oshie, who was charging in the opposite direction, towards the goal. The play was praised by Oilers goaltender Cam Talbot. “That’s an all-world pass by one of the best playmakers in the game,” said Talbot of Backstrom’s feed. T.J. Oshie was asked about the play in his postgame media session. Mike Vogel asked Oshie how he (Backstrom) does it, and how did he (Oshie) know he was going to do that. Oshie said “You’re gonna have to ask him how he does that stuff…I’ve been spoiled for a little while here playing with 19, and tonight was no different”. 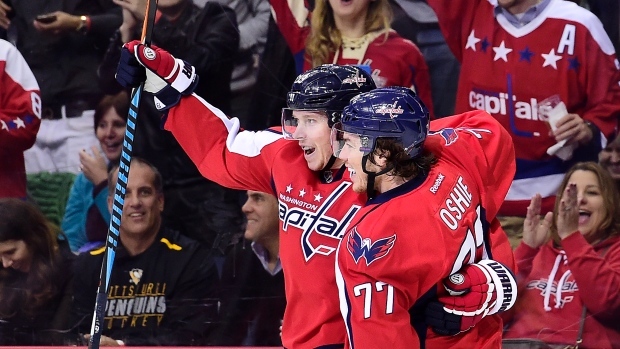 Backstrom and Oshie have been developing a great synergy in their line play. You may recall the following play from 2017, where Oshie anticipated a shot by Backstrom, provided a screen, then moved his left leg out of the way to provide an open lane for Backstrom, right when Backstrom released the shot. Oshie would comment after the game, “Nicky’s a smart player, I think he knew what I was doing”. The coordination between Backstrom and Oshie on the play is truly a thing of beauty. Textbook “screen and shoot”, but executed to perfection. The Capitals return to action Wednesday night when they host the Pittsburgh Penguins at Capital One Arena. Puck drop is set for 7:30 PM ET on NBC Sports Network. This entry was posted in News and tagged Cam Talbot, Edmonton Oilers, Jon Sorensen, Nicklas Backstrom, T.J. Oshie. Bookmark the permalink.